Barnes finished Game 1 with an impressive all-around double-double, dropping 19 points on 8-of-14 shooting (3-of-6 from three-point land) and adding 12 rebounds, 3 of which came on the offensive glass. Aside from the numbers, Barnes was repeatedly open when Stephen Curry was dealing with double teams (which occurred very often Monday night), making it easy for his teammates to find him for smart, open looks at the basket. Green, who has seen his playing time increase with the season-ending hip injury to David Lee, made the most of it last night, contributing 10 points, 7 rebounds, a steal, and two blocks before finally fouling out halfway through the second overtime. His energy and physicality was infectious for all 38 of his minutes, as Green constantly bothered any Spur he came in contact with. Ezeli received the starting nod for the Warriors and made his presence known on the defensive end for his entire outing. While he only played 12 minutes in the whole game, Ezeli had great self-control, recording a block and avoiding any personal fouls in his time on the court. Also, while an individual’s plus-minus rating is dependent of those on the court around them, it’s still a testament to their teams performance while any individual is in the game; with that in mind Ezeli’s plus-minus of +9 (second highest on the team) was proof of how effective he was on the defensive end for the Warriors. The Spurs proved that they aren’t too old to stage a comeback, but the youth for the Warriors was on full display Monday night. After their effective and efficient performances, it was unfortunate that Golden State wasn’t able to walk away victorious. 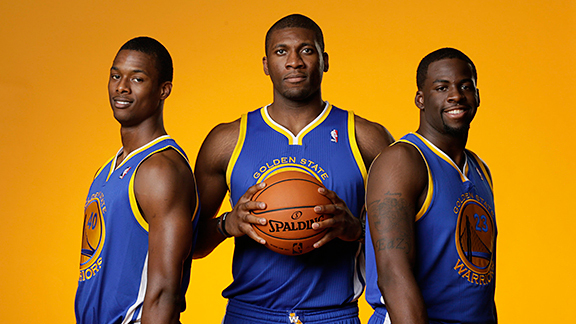 It seems as though the more experienced Warriors should step aside a bit more and allow the rookies to take over. This entry was posted in Home, Rookie Impact and tagged 2012 NBA Draft, basketball, Conference Semifinals, Draymond Green, Festus Ezeli, Game 1, Golden State Warriors, Harrison Barnes, NBA, NBA Draft, NBA Playoffs, San Antonio Spurs, sports by NBA Rookie Class. Bookmark the permalink.